Marrakech made me think again. When I imagined Marrakech, I pictured the sloping dunes of the Sahara, a bustling tangle of souk-merchants and, of course, 2-for-1 floor cushions on the discount racks at Anthropologie. I wasn’t even close. What I actually found was a city ablaze in color, sheltering the most remarkably progressive arts scene I’ve ever seen up close. Capital ‘C’ Culture, underlined twice, in red. It’s a city of creators revolutionizing Morocco’s artistic tradition, where the shopping, art museums, and music festivals can go toe-to-toe with New York any day. In Morocco’s rural regions and historic cities like Fez and Tangier, you’ll mainly see natives in ankle-length caftans, and women shielding their heads with thin black headscarves. This isn’t rare in Marrakech, but with a population that skews progressive, the locals are just as likely to be sporting jeans and sundresses. Amine Bendriouich, a Marrakech-born fashion designer, is Moroccan style, manifest. “You might say I’m king of nothing, and a student of everything,” he told me resolutely, when I met him at an artists panel at a local music festival. The panel featured a museum curator, a photographer, a poet, and Bendriouich himself, all of whom sat cross-legged on the ground while they spoke. Before the event began, Bendriouich, who was sporting the sort of oversized mustache one might expect on a French cartoon character, flitted around the space barefoot in a tunic and a pair of purple briefs. He pulled several clothing items off of racks before brusquely returning them, donning a floor-length robe with long leg slits just moments before the discussion started. His designs -- which he likes to say “lack adjectives” -- generally take the form of long traditional caftans with splashy amendments: silk capes, patches of neon fabric, angular cut-outs. Whether or not “king of nothing” is an accurate title, Bendriouich has been nominated for Arise Magazine’s best male designer award, led workshops for Adidas designers, and won the hearts of editors at global fashion bible, Vogue. “Marrakech taught me color,” Yves Saint-Laurent once said. Beyond Bendriouich, Marrakech boasts big names in the fashion industry like Artsi Ifrach and Karim Adduchi (who incidentally made it onto Forbes' 2018 “30 Under 30” list), among plenty of others producing work inspired by Moroccan prints and silhouettes. These folks are part of a visionary community repurposing native clothing into something definitively wearable and cool, even beyond the borders of the African continent. 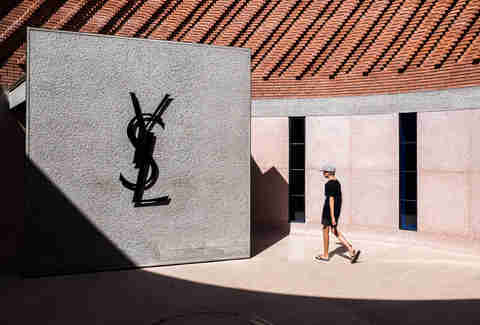 French designer Yves Saint-Laurent, the subject of a dedicated museum and a tributary garden in Marrakech, pioneered the use of Moroccan design in Western fashion. Inspired by the cut and color of traditional wear and the landscape of the Red City itself, Laurent crafted runway pieces evoking Morocco’s distinctive aesthetic. You can see them on display at the museum, as well as a series of photographs showing top models posing with merchants and artisans in the souks. “Marrakech taught me color,” Laurent once proclaimed, just after purchasing a cobalt blue villa in the area. Shopping in Marrakech quickly yields sensory overload. A map of the souk-lined alleyways -- if one existed -- would resemble a knot of tangled necklace chains. Once you enter, you’re lost -- it’s inevitable. If you pause to admire a woven basket for longer than it takes to inhale, you’ll be ushered into a kiosk, where a shopkeeper will all but remove your shoes for you. Between the hand-stitched caftans, the leather mules, and the plated jewelry, you’ll find vendors hawking argan oil and candied dates by the bucket-load. You’ll grow increasingly immune to the shouts of hagglers, and the occasional motorbike collision. 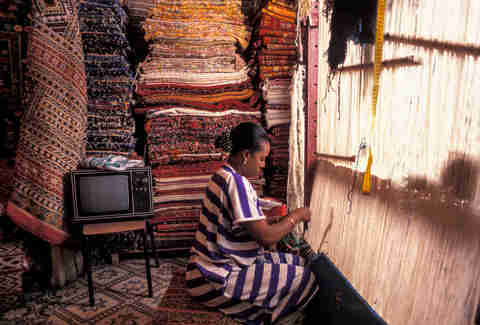 The handmade textiles should start out at approximately $10 (100 dirhams) if you can drive a hard enough bargain (here are some haggling tips if you’re feeling nervous). The size and style will drive up the cost, but in any case, you won’t be breaking the bank -- and remember these carpets would probably cost thousands at West Elm. 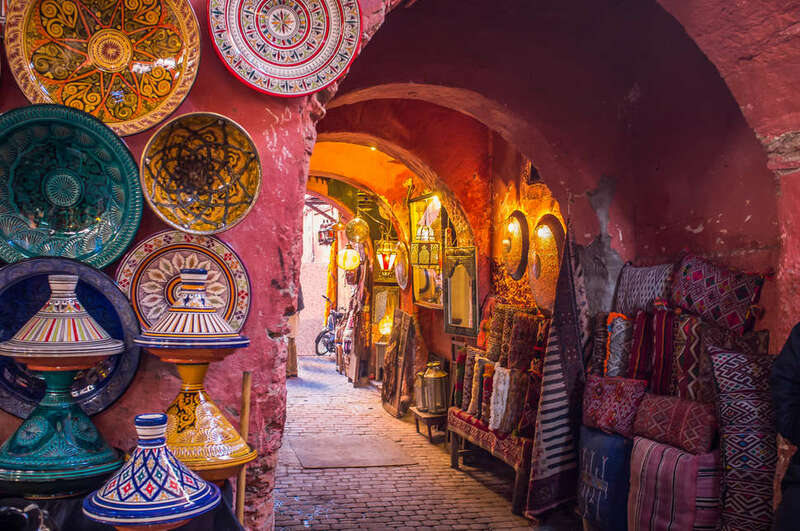 Once you emerge from the maze of the souks, you’ll find a burgeoning set of contemporary boutiques (fixed prices, my friends) vending upscale riffs on traditional items -- all of which would be equally marketable stateside. Try the souk-themed Max and Jan for dishware, appointment-only atelier Ministero del Gusto for costume jewelry (reportedly a favorite of Kate Moss), or minimalist concept store 33 Rue Majorelle for hand-selected works by local artisans. Marrakech’s Museum of African Contemporary Art Al Madeen (MACAAL) is the first of its kind on the continent. It only soft-launched in 2016, then to international audiences in 2018, so we’ll forgive Google for listing its location as, “Unnamed road, Marrakech, Morocco.” The museum boasts a series of permanent collections, an artists-in-residence program, and a number of temporary exhibitions, including “Africa Is No Island” -- a roster of moving photographs from artists stationed all over the continent. La Maison de Photography showcases 17th-century Berber portraiture and modern landscape shots in the setting of a traditional Moroccan riad. The photos grow more contemporary as you wander up the winding stairs; at the top there’s a roof cafe overlooking the souks. And in the feature-length category, the Marrakech International Film Festival takes place each November. In its 17th edition this year, there will be tributes to the likes of Agnes Varda and Robin Wright. If those names mean nothing to you, you can cling to the fact that Robert De Niro, who you’ve heard of even if you live in a cave, has confirmed his attendance. Traditional Moroccan music typically falls into one of two genres: Gnawa (generally spiritual, rhythm-heavy beats) and Raï (an undulating variation on Algerian folk music). Contemporary Moroccan tracks tend to remain within the bounds of these genres, but loaded with synths, drum machines, and electric guitars, unlike the traditional stuff. Give a listen to Casablanca-born rapper Dizzy DROS (who was technically arrested at 17 for disrespecting the national anthem in one of his tracks), along with Gnawa-style musician Nassouli, who’s been featured in a number of hip-hop tracks globally. 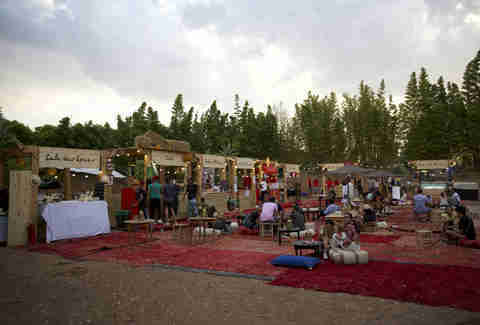 In terms of the music scene, hit Djemaa el-Fna square after dark and you’ll find a host of buskers performing while pedestrians scarf down lamb kebab from street carts. While it’s still light out, make the trek to Cafe Clock for some regional song and dance (order a camel burger). If you’d like to hurtle face-first into electronic music, the Oasis Festival takes over a patch of desert just outside of central Marrakech for three days each year, drawing an enormous crowd of techno kids from all corners of the world. Roped off with string lights and lanterns, the festival is something of a cultural microcosm of its city: Street vendors and local food suppliers line the walkways, native artists and designers curate tents, and art galleries set up temporary installations (last year, MACAAL was present). For visitors, it’s a concentrated hit of Marrakech’s ever-changing art scene. Once the panel concluded, I watched as he skipped off to join the nearest DJ behind his stand, uninvited, gyrating his hips to the thud of the bass. I nodded along quietly, flanked on one side by an Algerian photographer, and on the other by a gaggle of Moroccan students. I admired how dynamic it felt to be surrounded -- from all angles -- by locals devising the culture of their own city.